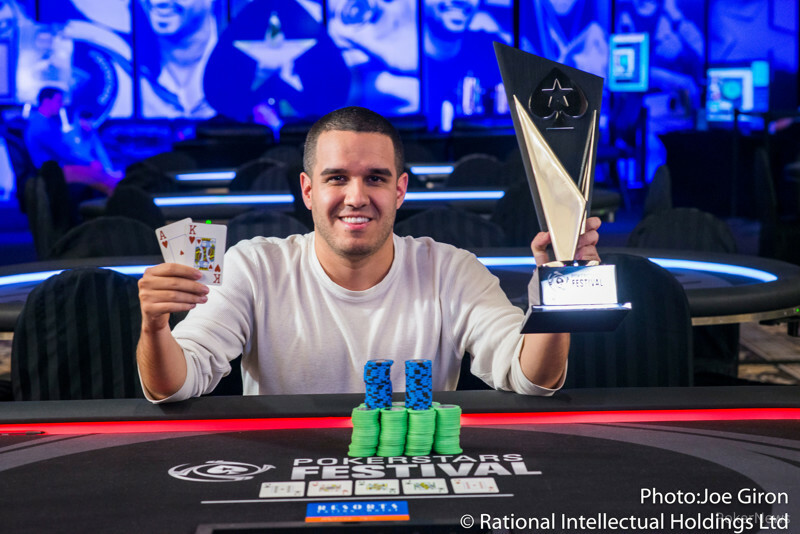 Jason Acosta said he was good at winning flips, and that proved to be an absolutely vital skill for him at PokerStars Festival New Jersey. 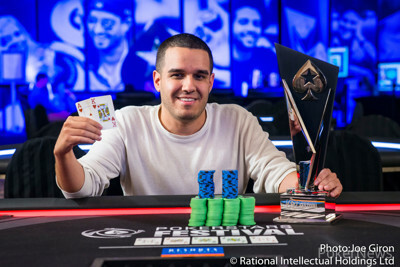 It enabled Acosta to prevail over a field of 208 players to win the $1,100 Main Event for a $38,220 first-place prize, roughly triple his previous total of live winnings. To do so, Acosta had to prevail over New Jersey online poker legend Michael Gagliano in the heads-up match, erasing a massive deficit in the process. Gagliano settled for second and $28,116, his second five-figure cash here at Resorts Casino Hotel after taking down the $2,000 Six-Max to open the festival. Acosta qualified for the tournament by playing in a 5,000 StarsCoin — worth $50 — satellite on PokerStarsNJ. He then took off work for the week and treated himself to something he doesn't get to do often. "I usually don't get to play live tournaments too much," he said. "Obviously, when you can get into an $1,100 event for a couple of StarsCoin, it's going to make it worth the trip. I don't know if I would normally drive down here to play an $1,100 event that would take me from Tuesday to Friday. But, since it's basically a freeroll, I couldn't pass up the opportunity." The tournament kicked off Day 3 already in the money with 23 players left. Headliners included two-time World Poker Tour champ Darren Elias, bracelet winners Chris Dombrowski and Jack Duong, and PokerStars Team Online Pro Randy Lew. While none of those players would find a way to advance to the final table, Acosta did, through a little bit of luck and his trademark flipping skills. First, he doubled with ace-king against the jacks of Rocco Dicondina with 13 players left. Then, he got his last 10 big blinds in on the unofficial final table bubble with ace-five against the nines of Jovy Ounthongdy, flopping an ace to survive. 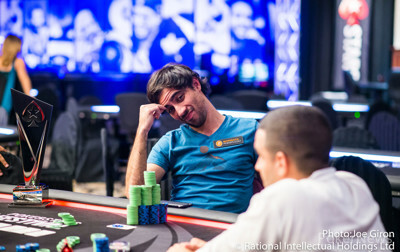 Acosta was still one of the shortest stacks at the beginning of the final table, while Matt Affleck had the lead after cracking Tom Revello's kings with queens just before the final table started. However, it was Eli Kim grabbing the early lead when he won a three-way all in with aces against the queens of British qualifier Peter Smyth and the sixes of a short-stacked Ounthongdy. Dicondina and Sridhar Sangannagari went bust to leave it a five-handed battle. At that point, it was time for Acosta to put his flipping skills to use again. He got tens in against the ace-king of Affleck and managed to hold despite a flop. He then got it in a little better than that, shoving 28 big blinds over a Kim open with ace-king and winning against king-queen. Affleck went out fifth after Gagliano three-outed him for most of his stack, and then Acosta moved into the lead for the first time when he won with queens against the tens of start-of-day leader David Johnston. Johnston was left short and busted soon after. Then, Kim got himself in a massive flip against Gagliano that looked like it would decide the tournament. With blinds at 15,000/30,000/5,000, Kim opened to 70,000 on the button. Gagliano made it 215,000 in the small blind. Kim came back with a four-bet to 650,000, and Gagliano shoved. Kim called for 1.8 million or so, saying he felt Gagliano was probably shoving light. The flop came ace-high, and Gagliano had more than a 7-1 lead going to heads up. It looked like a mismatch of epic proportions with the accomplished online player and World Series of Poker bracelet winner against the short-stacked 30-year-old amateur from Little Ferry, N.J. Acosta had no illusions. "He's obviously a much more accomplished player than me and I knew I was at a huge disadvantage," Acosta said. Of course, Acosta got the comeback started by winning another race. He held with sixes against ace-eight to double to a workable 30 big blind stack. Then, a key cooler happened on a board of . Acosta shoved over a sizable bet on the end with and got a tank-call from Gagliano, who had for an inferior straight. "I pretty much coolered him," Acosta said of the spot. "From there, I just tried to stay real aggressive. It's gonna be tough to outplay somebody like that. He's not gonna make any mistakes, so I pretty much had to wait for spots were I had better hands than him." Acosta mostly stayed in the lead from there, making big hands at the right times and finally ending on, what else, a flip. His ace-king prevailed against sixes when the board double-paired to send him the trophy and prize money. From there, it's back to the grind for Acosta, but not of the poker variety. "Go to work," he said simply, when asked what's next. Michael Gagliano pushed all in from the button for about 1,000,000 and was called by Jason Acosta. Gagliano was ahead but facing Acosta in his specialty flip. The flop kept things interesting as Acosta still needed help but picked up more outs. The turn furthered the amount of cards he could catch. On the river, a arrived to counterfeit Gagliano's pair and give the tournament to Acosta. Michael Gagliano raised to 100,000 from the button and Jason Acosta called from the big blind. The flop fell and Acosta checked to Gagliano who bet 100,000. Acosta called. The turn was the and Acosta led for 125,000. Gagliano called. The river was the and Acosta bet 275,000. Gagliano mulled it over for a bit, but opted to fold. Jason Acosta limped the button and Michael Gagliano checked his option. They checked to the turn of a board where Gagliano bet 65,000. Acosta called. The river was the and Gagliano bet 150,000. Acosta popped it to 400,000 and Gagliano folded. Jason Acosta opened to 100,000 and Michael Gagliano made it 300,000. Acosta quickly called and Gagliano checked a flop of . He called 150,000 and both checked the turn to see a final board of . Gagliano bet about 300,000 and Acosta snap-called. Gagliano showed what looked like and mucked quickly upon being shown for trips. Jason Acosta raised to 100,000 from the button, Michael Gagliano three-bet to 300,000 from the big blind, and Acosta called. They checked to the turn of a board where Gagliano bet 300,000. Acosta folded. Gagliano showed the as he collected the pot. Jason Acosta opened to 100,000 from the button and Michael Gagliano called from the big blind. They checked to the turn of a board where Gagliano bet 125,000. Acosta clicked it back to 250,000 and Gagliano called. Gagliano showed , but was beat by Acosta's .